Posted in: A Walking Tour of Old Ravenswood. Tagged: 1883 structures, 1905 structure, 4550 N Hermitage Ave., Alfred H Piquenard, All Saints Episcopal Church, Carl Sandburg, Chicago Churches, Cochrane & Piquenard, Cook County Hospital, Crash of 1929, Frame Structures, Grace Sulzer, Illinois State Capitol Building, Jefferson Park Presbyterian Church, John Cochrane, John Hulla, parish halls, rectories, Rush Medical College, Tudor Style. This 1883 church is an outstanding example of stick style architecture in which the vertical and horizontal protrude from the clapboard voids between them, and are painted differently from the clapboards to accentuate the structure of the building. It was stuccoed in the 1920’s, covering highly decorative clapboard and shingle work. Note the many diagonal elements still visible, which add a sense of vigor to the rest of the structure. The original entrance was at the northeast corner of the church, under the bell tower. This door has now been sealed and has a window in its place. Most windows are original. The architect, John Cochrane (1835-1887), is best known for winning, at age 32, the design competition in 1867 for the new Illinois State Capitol Building in Springfield. Between winning the prize and signing the contract he formed a partnership with Alfred H. Piquenard. Cochrane & Piquenard are the architects of record for that building. He also designed a number of other important buildings, including parts of Cook County Hospital and Rush Medical College, as well as Jefferson Park Presbyterian Church. He died at the age of 52 only four years after designing All Saints. The rectory was designed in a Tudor style by a parishioner, John Hulla, and built in either 1908 or 1905. The passageway connecting the rectory and the church was built in the 1920’s and detracts from the overall composition. The Parish Hall, on Wilson Avenue, was completed in 1936. 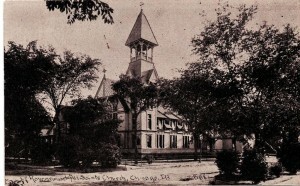 The funds used for the parish house were collected in the 1920’s toward the goal of a new Gothic stone church on the site of the 1883 frame structure. Were it not for the 1929 crash, this wooden church would not exist. Former parishioners include Carl Sandburg, who lived nearby, and Grace Sulzer, granddaughter of the first European settlers of Lake View Township. 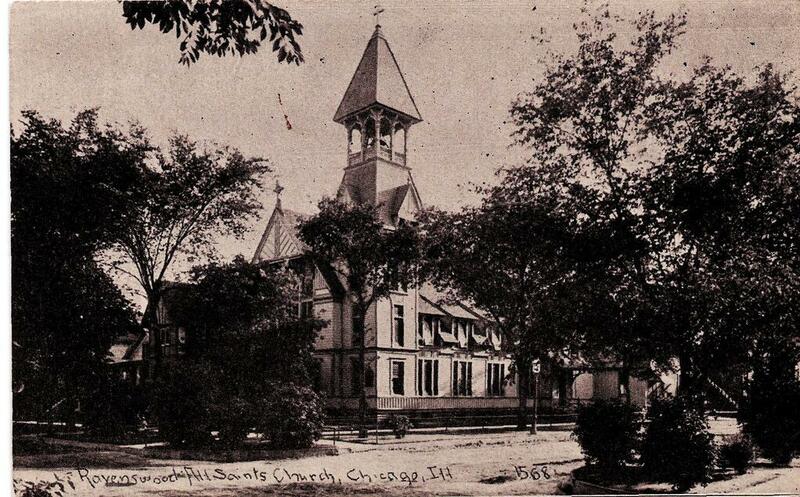 CCL Survey; Parish Records; Lane, George: Chicago Churches and Synagogues. Chicago: Loyola University Press, 1981. Permits #11802 (8/12/1908) and 18222 (4/26/1905). No permit for original construction. Historical records. Continue the tour to 4542 North Hermitage Avenue. The next building is across the street, about 121′ south along Hermitage.